It’s a once in a lifetime event, so why not serve the finest premium quality artisan hand-made Prosecco to make your guests really feel the love on your Wedding Day? 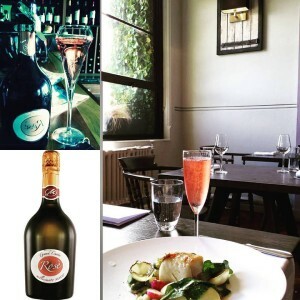 We offer a range of price points and formats right up to the Grand Cru of Prosecco which is Cartizze – very rarely found outside of Italy but you will find it on the wine menu of The Merchant Hotel in Belfast. 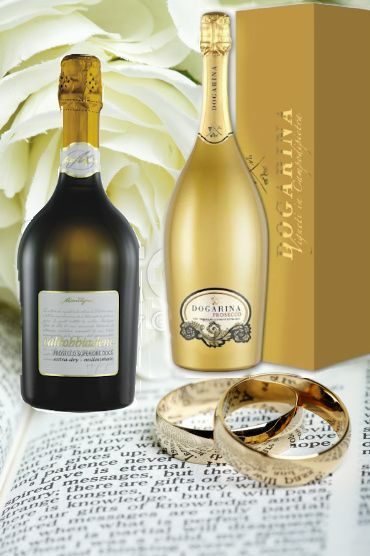 We also offer very opulent gold magnums of Prosecco, which will really impress your guests. All of our Prosecco can be found in the finest 5 star hotels and Michelin Star restaurants including The Merchant Hotel, OX, James Street South, The Old Schoolhouse and The Boathouse to name but a few. Many people these days are selecting wedding venues which allow you to bring your own wines and you can certainly save a lot of money by doing that. However even if you do choose a hotel or licensed venue, you may still have the option to bring your own Prosecco if you ask. We have had brides paying a corkage fee of £6 a bottle at leading hotel wedding venues but they still saved around £8 a bottle and sometimes more, by bringing their own quality Prosecco instead of paying a higher price for what can often be a chemical, acidic, poor quality product resulting from high production volumes, machine harvested and on many occasions downright old Prosecco. Our Prosecco is always ‘Millesimato’ which means that the producer is obliged to print the year of vintage on the rear label so that you know it’s as young and fresh as it can and should be. Due to the production method, Prosecco needs to be consumed while fresh unlike Champagne which can age. This Rosé is made from 100% Pinot Noir grapes has a sublime very pale colour, derived only through contact with the skin of the delicate Pinot Noir grapes, so all natural. 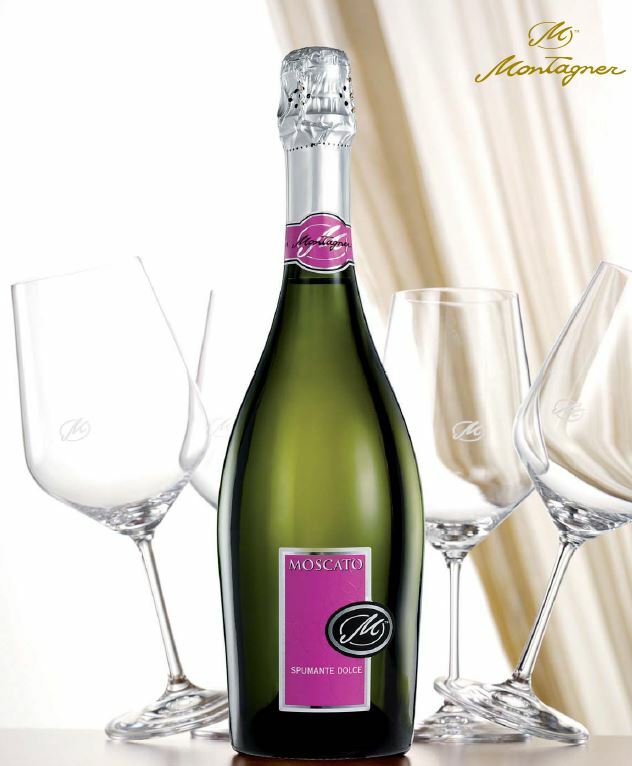 It is a Brut style which means it has less residual sugar and therefore Dry, but this is perfectly balanced by the intense rush of Raspberry aroma which explodes from the glass with every exuberant bubble. 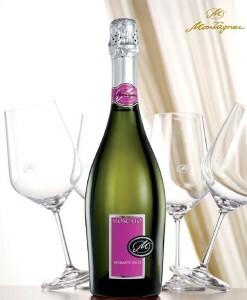 This is a truly stunning, elegant hand crafted sparkling Rosé wine. Go try it by the glass at OX Cave, The Old Schoolhouse, Tedford’s Kitchen or The Merchant Hotel! Sparkling Red Served Slightly Chilled? Or perhaps you want a real talking point? 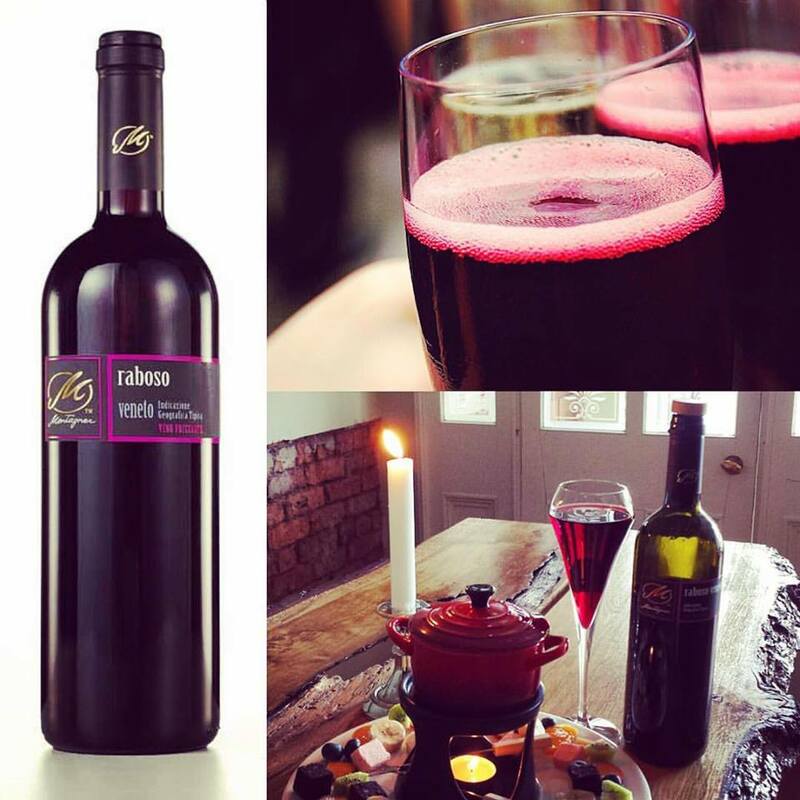 Then try our Sparkling Red Raboso Frizzante served slightly chilled as an aperitif or even better paired with a chocolate dessert. People quite simply go crazy for this wine once they’ve tasted it. From people who don’t like red wine, to full bodied Red Wine drinkers, wine lovers from a diverse range of palates and preferences just can’t get enough of these unique bubbles and because the wine has a hint of sweetness, it pairs beautifully with chocolate. In fact Will Bown at The Old Schoolhouse developed a Chocolate and Cherry dessert just to pair with this wine which he personally loves! A Stunning Moscato Spumante Perhaps? This Moscato Spumante is reffered to as ‘Fior di Arancia’ in Italy which means ‘Orange Flower’ and you will also get aromas of Roses and Elderflower from this lively sparkling wine. It has a hint of sweetness while not too sweet, but it is extremely elegant as an aperitif, with the dessert course, with afternoon tea or these days also with breakfast if you check our the hashtag #MoscatoWithBreakfast you’ll see that it is now very much a thing! At only 7% Volume this lower alcohol option means you can indulge at the Wedding breakfast and still be awake at the altar! An Elegant Moscato Spumante for Weddings! GreatVine can offer two types of personalisation for your Wedding Prosecco or Champagne. The cheaper option is a neck ribbon and personalised sticker with the name of the Bride & Groom and the date on the neck of the bottle. The second option is a fully branded bottle to your design but the minimum order for this option is a single pallet or 83 cases / 498 bottles. Please bear in mind that a 6 week lead time is required for delivery with this option. Fully branded bottles can be produced to your design brief for a lasting memory of your big day! 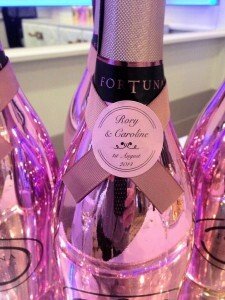 These bottles can feature an image of the bride and groom and any text or other design features you would like.